Starter herd packages are available as well as trade outs for established herds in need of new genetic lines. Contact Alan for more information and availability. Trade - We trade yaks for buffalo. 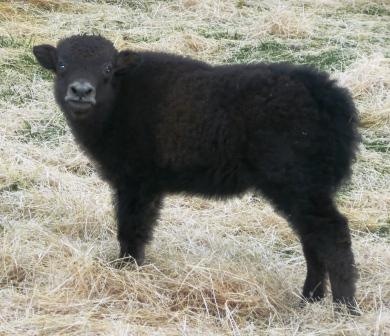 We currently have yak calves, yearling heifers and bulls, 2 year old heifers and breeding bulls for sale. Prices vary according to type and lineage. The type will also determine the price. There are 5 different major yak types in the US. There are 4 separate breeding herds at the ranch. This makes it ideal for the buyer looking for unrelated animals to start a herd. Trim and Imperial Grey noses are the most common and are raised for meat production. The trims typically have a white triangle on their foreheads, white on the tips of their tails or on their feet. Over 90% of the world's yak population of nearly 15 million lives on the Tibetan Plateau in the Himalayas. Lamps in Tibetan monasteries are fueled by yak fat. Yak cheese has higher amounts of heart-healthy fats than cheese from dairy cattle. Yak polo, played on yaks instead of horses, was pioneered in Mongolia ten years ago. The average male yak weighs about 450 kg or 1,000 pounds. The first yakalo, a cross between a yak and an American bison, was produced through selective breeding in Alberta, Canada in 2000. A major use of the coarse yak tail hair is for fake beards used in Chinese opera. In local communities, yak bone is often made into exquisite handicrafts, including combs, buttons and ornaments. The only natural predator of the wild yak is the Tibetan wolf. In Mongolia yak milk is fermented in a leather pouch and distilled as a "milk wine" called archi.